The Zombies are Coming Again! In Plants vs. Zombies, you learned that the best way to defeat an undead army was not to soil your pants, but to soil your plants! By planting a defensive line of weaponized herbs that could shoot, block and blow things up, your home was kept safe from everything living, dead and undead. However, just when you thought it was safe to go out and mow the lawn, the zombies came back in full force. Not only that, but they’ve dug their rotten little fingers into the past! Looks like you’re going to have to travel through time via Crazy Dave’s time machine and take them out before they overrun history itself. The zombie horde is as relentless as ever. They’ll be shambling over to your home with only one thought on their minds: your brains in their mouths. Fortunately, you still have your seeds ready to keep them at bay. With all the classic plants from the first game as well as a garden variety of new ones to back them up, your brain should be safe for at least another day. Plant Sunflowers to generate the sunlight needed to purchase new plants. Deploy pea shooters to fire peas at high speeds into decaying flesh. Set up Wall-Nuts to slow the zombies down. Immolate the zombies with fire-breathing Snapdragons. Blow numerous zombies up with the explosive Coconut Cannon. Create freezing traps with Iceberg Lettuce. Use the Bonk Choy and have him pick a fight with every zombie that gets too close. Kill Zombies in All New Ways! 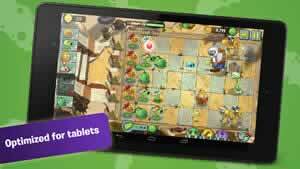 Plants vs. Zombies 2: It’s About Time isn’t just the old game with a facelift. It packs a host of all new features and improvements that will change the way you look at modern gardening and the walking dead forever. Features improved graphics with greater fidelity and smoother animations. Fight zombies in a variety of time periods, including ancient Egypt, the Wild West, the golden age of piracy, and more! Kill zombies with devastating finger powers. With a stroke of your finger on the screen, you can pinch their heads off, toss them off your lawn, or zap them with chain lighting. Includes non-linear level progression. Travel across the map, collect keys to open locked nodes, and tackle the challenges in any order you like. Power up your plants! Feed them rare Plant Food to give them a boost of power that will make them more deadly than ever before. Plants vs. Zombies once again proves to be the undisputed king of the tower defense genre with It’s About Time. With new features, plants, powers, touchscreen controls and improved visuals on top of the original title’s sense of humor, you can rest assured that you’ll have a quality game of strategy that you’ll likely never put down. If you couldn’t get enough plant-on-zombie action from the first game, or just want to see what the entire hubbub is about for the first time, then download Plants vs. Zombies 2 right now and start tending to your new garden. It’s to die for! Fending off a zombie apocalypse with a garden of weaponized plants may sound like a bizarre idea in the world of computer games. 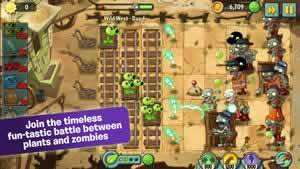 However, Plants vs. Zombies proved that you could most certainly breathe new life into the zombie-slaying business by being one of the biggest, funniest and most stylish tower defense games out there. 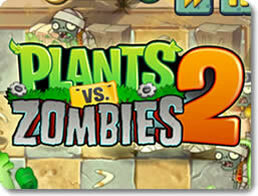 The long-awaited sequel has finally come out in the form of Plants vs. Zombies 2: It's About Time. How does it hold up? On one hand, it shows that the guys at PopCap still got it. The game brings back everything that was great about the original while introducing a whole lot of other fun stuff. Unfortunately, it also has an ugly side that's come about from the free-to-play business model that it has adopted. It's not as bad as it could be, but it's still a noticeable stain on an otherwise beautiful painting. It Really Is About Time! Your neighbor, Crazy Dave, is at it again with another crazy contraption: a time machine named Penny. With Penny, he can travel to any point in time, including the moment he just ate a delicious taco that he would like to taste again. However, Penny goes a little too far into the past and dumps you, Dave and the zombies into ancient civilization. Looks like you're going to have to pit your plants against zombies all across history. No one has ever played Plants vs. Zombies for its riveting plot. It's always been there just to provide an excuse to kill waves of zombies. Nevertheless, the new time travel theme opens up a plethora of jokes that make Plants vs. Zombies 2 an even bigger riot than its predecessor. The original Plants vs. Zombies already had a strong visual flair. The colors were vivid, the animation was fluid, and both the plants and zombies had a lot of character put into them. Plants vs. Zombies 2 leapfrogs over the original game's presentation in every way. The visuals are crisper, the animation is even smoother and more sophisticated, and the number of environments has grown. The characters are also as goofy and lovable as ever. The zombies are adorably grotesque, but not disturbing to look at, especially when you take the funny clothes they wear into account. The historical theme allows for a greater variety of zombies to be seen as well; you'll see some dressed up as mummies in Egypt, pirates in the Caribbean, or cowboys in the Wild West. Meanwhile, while the great majority of plants still look the same, there's really no room to complain; they each retain a distinct personality after all. The Sunflowers remain sunny and happy amidst the carnage happening around it, the pea shooters are determined, the Wall Nut grows increasingly more concerned as he is devoured alive, and the all new Bonk Choy looks like a battle-hungry boxer who's ready for his next fight. The core gameplay of Plants vs. Zombies is as strong as ever. Once again you're tasked with defending your home from a wave of zombies by placing the right plants on your lawn strategically. Plants come in all sorts of flavors and functions. The Peashooter fires basic shots at zombies, the Wall-Nut blockades them for a time, Potato Mines make for explosive traps, and Chompers devour anything that gets too close. Through it all, you're limited by the amount of Sunlight you have in store, which can only be collected by deploying enough Sunflowers. Managing your resources and knowing where to put your plants is vital if you want to survive. Things get a bit crazy when you take the new Plant Food item into account. What this little baby does is provide a temporary boost in power to your plants. The Peashooter can effectively turn into a machine gun, the Wall-Nut dons a suit of armor, a Snow Pea can freeze multiple enemies at once, and so on. Plant Food adds a whole new level of strategy to the mix, making it incredibly useful as things grow hectic. It's also a lot of fun to see all the enhancements it's capable of unleashing. The levels are also filled with more gimmicks that change how the game is played. For example, the pirate levels take place on ships out at sea. This gives you ample opportunity to throw the pirate zombies overboard for an instant kill. Meanwhile, the Wild West levels feature mine carts that allow you to shift a single plant across multiple rows, giving you more defense with fewer plants on hand. It all works very well and ups the variety of the game considerably. Finally, the sequel introduces boss fights. These things are absolutely insane. They take tons of damage, are capable of destroying your plants instantly, and summon zombies quickly and en masse. These levels also eschew the sunlight mechanic, opting to give you random plants at timed intervals instead. These stages are hectic and a lot more fast-paced than the rest of the game, which makes beating them feel like a great accomplishment. Sadly, there's one thing that possibly holds Plants vs. Zombies 2 back. The game is free-to-play, which means that instead of buying the whole thing up front, you have the option of buying an assortment of perks that aren't available anywhere else. By spending money, you can earn coins and use them to purchase unique powers that can kill zombies with a flick of your finger. On the plus side, spending money is usually optional and really just amounts to unlocking some cheats. Even so, it's impossible to ignore the fact that the game is trying to get your credit card number every step of the way. During its lifetime so far, Plants vs. Zombies 2 even had a few periods where necessary content was gated behind a paywall. For instance, lawnmowers, which act as your last line of defense, could be lost forever after use. The only way they could ever be restored was to buy them from the store again. This feature was thankfully patched out, but it's not an assuring sign of what to expect from future updates. Make no mistake. Despite lingering complaints of the microtransactions that are present to an annoying degree, Plants vs. Zombies 2 is still a fun game. It's every bit as strategic as the original. It's still full of wacky plants and crazy ways of killing the undead. The zombies are as charming as ever, and the ways they'll try to overcome your defenses are a hoot to watch. The game can also thankfully be completed without ever coughing up the dough. If you're intrigued in any way, there really is no reason to not at least give Plants vs. Zombies 2 a try. At the very least, consider it an extensive demo. If you like it, then you are all set. If you don't, it will be no skin off your nose. If you like what you see, but want a more complete experience, then it will give you a good excuse to grab the first game if you haven't already. In that regard, Plants vs. Zombies 2 deserves a whirl at the very least.